Who is Allah? Is he the god of the bible? Nope. Well the Arabs came up with their own version based on the Sumerian version. In ancient Syria and Canna, the Moon-god Sin was usually represented by the moon in its CRESCENT phase. The sun-goddess was the wife of Sin (Venus) and the stars were their daughters. For example, Ishtar was a daughter of Sin. The archaeological evidence demonstrates that the dominant religion in Arabia was the cult of the moon-god. The Old Testament consistently rebuked the worship of the moon-god (Deuteronomy 4:19; 17:3; II KIngs 21:3,5; 23:5; Jeremiah 8:2; 19:13; Zephaniah 1:5). When Israel fell into idolatry, it was usually to the cult of the moon-god, SIN. Remember the Golden Calf? We already discussed his three daughters in a previous post. These three goddesses were called Al-Lat, Al-Uzza, and Manat. Al-Uuzza, is still worshipped as the black stone (meteorite) in MECCA. The pagan Arabs even used Allah in the names they gave to their children. For example, both Muhammad’s father and uncle has Allah as part of their names. The fact that they were given such names by their parents proves that Allah was the title for the moon-god even in Muhammad’s day. The pagan Arabs worship the Moon-god Allah by praying toward Mecca several (5=pentagram) times a day; making a pilgrimage to Mecca; running around the temple (backwards) of the Moon-god called the Kabah; kissing the black stone; killing an animal in sacrifice to the Moon-god; throwing stones at the devil; fasting for the month which begins and ends with the crescent moon; giving alms to the poor, etc. There are four interesting parallels with Islam here: (a) Akhenaton made the male sun-god the one and only god of Egypt, while (b) Muhammad made the male moon-god the one and only god of the Arabs. Neither god remotely resembled the God of the Bible, both being pagan deities borrowed from polytheistic religions. SIN (derived from Suen, was also called NANNA. Nanna is a Sumerian deity, the son of Enlil and Ninlil. NANNA or Su’en (SIN) is due to association with Akkadian na-an-na-ru “illuminator, lamp”, an epitheton of the moon. He is commonly designated as En-zu, which means “lord of wisdom”. 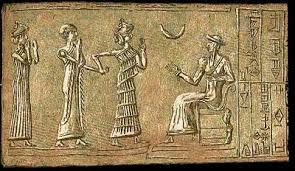 His wife was Ningal (“Great Lady”), who bore him Utu/Shamash (“Sun”) and Inanna/Ishtar (the goddess of the planet Venus). Sin had a beard made of lapis lazuli and rode on a winged bull. The bull was one of his symbols, through his father, Enlil, “Bull of Heaven”, along with the crescent and the tripod (which may be a lamp-stand). On cylinder seals, he is represented as an old man with a flowing beard and the crescent symbol. In the astral-theological system he is represented by the number 30 and the moon. The 33rd degree of freemasonry also ties in with this. They are all Muslims at this level. Shriners have to be 32nd degree freemasons as well. Islam is the antichrist religion. They are worshipping SIN or LUCIFER. We talked about the Catholic Church doing this as well with VENUS WORSHIP and Dianna. It’s all the same PAGANISM. This is Babylon the Great. THe WHORE of many names and religions. It is all Luciferian. They are ALL FALLEN ONES. Furthermore, They had their own progeny. The children of the Nephilim. YaHuWaH’s children were Adamic. They are the seed of Abraham. They are of the order of Melchizedek of SALEM. This order was of a prior earth age before the flood in Genesis. Mel chi stands for MILKY WAY GALAXY. Melchizedek was/is The High priest of EL Elyon or the Most High God, YAHUWAH. He is none other than YaHuShuWaH or Jesus the Christ! The WAY. The MELCHI WAY. Our Elohim created and designed the Milky WAY Galaxy for us! This is the ORDER OF MELCHIZEDEK. It is the part of the MAZZAROTH that concerns US. All of these other created beings (demigods) were still part of HIS DESIGN. MELCHI also means DARK, MILKY, Murky WAY. Dark rift? We only can “SEE” in part. We “SEE” through a glass darkly. We are situated in a “MILKY WAY” Galaxy. Can you see how YaHuWaH has corrulated HIS WORD and written our destiny in the Heavens? We serve an awesome Elohim. The one who made Heaven and Earth. His name is YaHuWaH. Allah is just a phase of the MOON. The Crescent MOON. A created heavenly body. He is not god. He is SIN- the Illuminator. He is Nanna, the false parent/nurturer. He is a hermaphrodite- Venus/Hesperus. Diana/Apollo. Daystar/Evening star. He is a LIAR and the Father of it. Posted on August 16, 2014, in Bible Figures, Illuminati, ISIS, spiritual warfare, The Mazzaroth and tagged Allah is NOT the god of the bible, ALLAH is the Crecent Moon, Crescent Moon in Islam, Mt Sin Jar and Yazedi's, SIN=NANNA=ALLAH, The black stone in Islam. Bookmark the permalink. Comments Off on Who is Allah? Is he the god of the bible? Nope..